With more than a million players worldwide, Pathfinder is the world's most popular tabletop RPG. Sam Sykes has joined the Pathfinder world. I know there are a lot of readers out there excited to find this out. 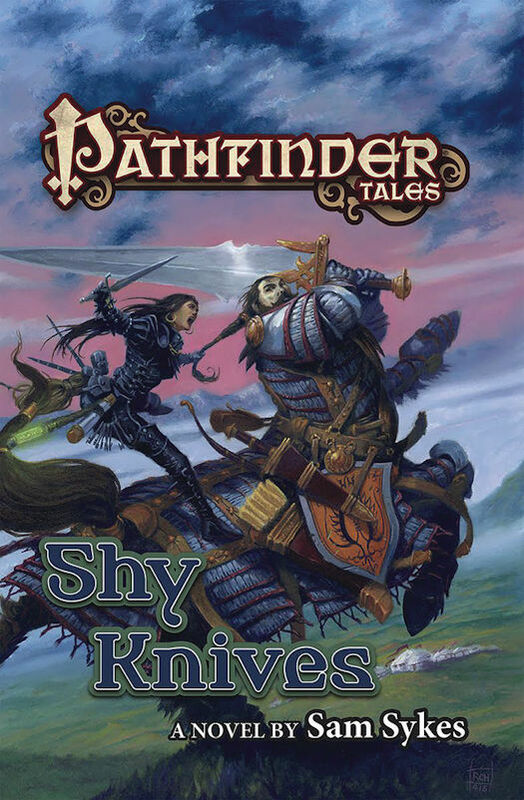 Sykes brings his humor that has won him many fans in the past to a gripping who dunit mystery set in the Pathfinder world entitled Shy Knives. Shaia ‘Shy’ Ratani, a thief with a heart of bronze who hasn’t quiet decided to turn away from her roguish ways is hired by Dalaris, a grieving woman whose betrothed was murdered. Everyone says he was murdered by centaurs, but Dalaris believes there are hidden forces working against her and her now dead fiancé. It becomes Shy’s job to find out who really killed him and why. As is common in most of these murder mysteries dealing with the upper class, nothing is as it first appears, including the characters. Sykes does a wonderful job making Shy a truly engaging rogue. Her wit is always on point and often gets herself into trouble as she has no filter on what she says. This is where the majority of the famous Sykes’ humor comes into play. I also enjoyed the fact that Shy was still and foremost a rogue and wasn’t afraid to look after herself and break and bend rules to get the job done. Dalaris is also a wonderfully complex character who at first doesn’t appear to have a lot of depth but then you learn she too holds her secrets. My only complaint is a personal one. I have never been a fan of first person narratives. I know this is a personal preference. For me it’s harder to get immersed into a story. It also makes me always wonder if I can trust the POV of the character. Another part of this story that might be an issue for other readers is the humor. It’s not a comedy by any means, but Sykes’s humor is unique and I can see if you don’t like his style you might find the book irritating. Some readers like their fantasy dark and serious, so take that into consideration. Shy Knives is a perfect rogue’s tale. Sam Sykes knows how to write an interesting and humorous fantasy murder mystery. If any of those things are interesting to you, I would highly suggest you read this book. There are minor adult situations, language and violence so I would recommend it to older teens and adults.